Sorry for the long delay. Haven’t had much to say, really. I was sick as a dog for 2 weeks after the marathon. I heard that one’s immunity is at its lowest after a marathon, so I figure I picked something up soon after the race. So, after a week of coughing and a running nose, then another week of coughing and a z-pack from my doctor, I improved enough to go for my first run. Two weeks without running was weird enough, but the way I felt when I returned to the road was even stranger. Nothing felt natural. It was as if I had just started running. Here we are a week later and into week 2 of my marathon running recovery and I feel better. I did go to the orthopedic doctor last week for an examination of a nagging foot issue I’ve had since late October. It turns out I have a mild case of posterior tibial tendonitis. 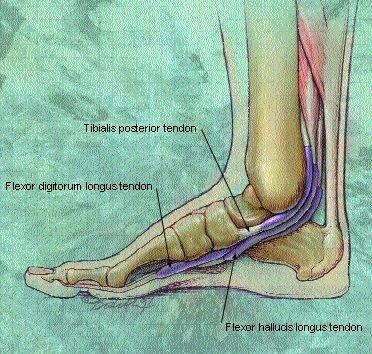 That is to say that I have a slight swelling in the big tendon that wraps down your lower leg and around the back of that ankle bony-knob on the inside of your foot and connects to the tarsals below. Dang. Just look at the picture below. The first arrow, the one on the upper right is pointing to the exact spot where I have developed a small knot in that tendon. This tendon helps support the arch, so when you have an issue with the tendon you can suffer fallen arches and/or feel soreness in the arches. That’s exactly what I felt beginning in late October. Weird thing though, it got better over time. Even as my mileage picked up in November and December, the soreness subsided and only appeared late in long runs or 8 or so miles or more. This is a common overuse injury and can be corrected or treated by stretching techniques and even the use of an orthotic. So I’m getting fitted for an orthotic on Wednesday. I’ll have it in a week and will see how it goes. I’ve also experienced intermittent numbness in my left pinkie toe. The ortho doctor was not concerned and said this is a common occurrence in some long-distance runners when the feet pound for so long on the pavement and nerves therein get smacked around. It is getting better, so I no longer think I’ll lose a foot. Here are a few things I haven’t missed since running Disney: clif shots and powerade. I had enough of both of those during the marathon to last for a long while! What’s next? My friend Lisa is working on a half-marathon training plan or me with the goal of running in Nashville in the Country Music Marathon/Half-Marathon on April 25. Recording a new episode of the podcast tomorrow on a cold morning run. Supposed to be 23 degrees when I head out. What is this, New England? Well, at least you have a diagnosis. Welcome to the Orthotics Club!! !Sorry you got so sick after Disney. Does sound typical. Hey — at least you had a real illness; must have occupied your mind and perhaps limited the marathon blues?Nashville half — very cool! I just ran the New Orleans Mardi Gras Marathon, and have also been sick since. I just keep telling myself that it is just part of the experience.